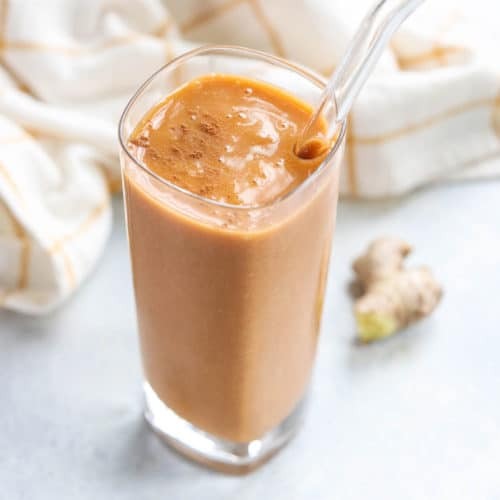 This Sweet Potato Smoothie is a healthy breakfast option, made with cooked sweet potatoes and anti-inflammatory turmeric and ginger. It tastes like pumpkin pie in a glass! Why Sweet Potato in a Smoothie? After testing so many Instant Pot Sweet Potatoes, my fridge has been filled with leftovers! 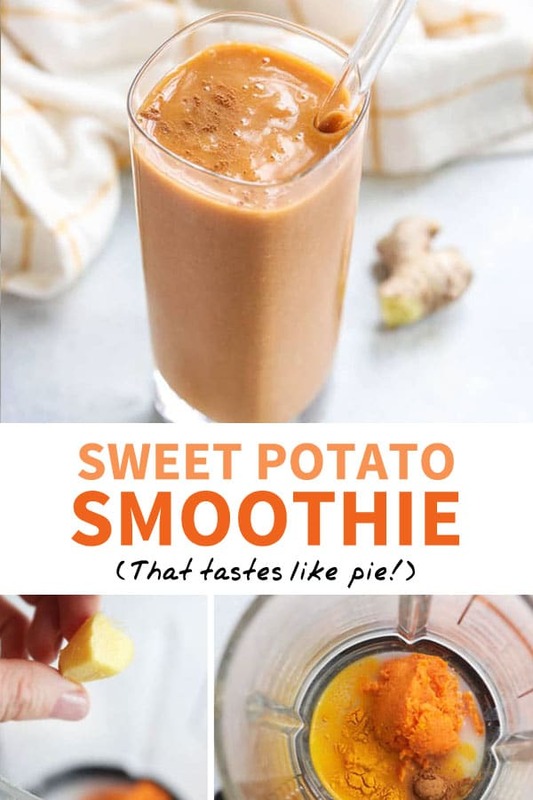 Cooked sweet potato adds a silky creaminess to final smoothie, plus a touch of naturally sweet flavor, so you don’t need as much fruit or other sweetener to get a pie-like flavor. Adding sweet potato to your smoothie adds extra nutrition to your morning! Here are some of my favorite things about them. They’re loaded with beta-carotene, an antioxidant that is thought to promote eye health. They may help boost immunity, thanks to that beta-carotene being converted to Vitamin A, which is critical to a healthy immune system. They contain both soluble and insoluble fiber. Fiber-rich diets may help to lower risk of colon cancer and constipation, and may also help to promote overall gut health. What I especially love about cooked sweet potato is that it blends easily into a smoothie, even if you don’t have a high-speed blender. My children can’t even tell if I add a bit to my go-to smoothie recipe for kids. I tend to make this smoothie when I already have some leftover baked sweet potato on hand. If you don’t have any, you can use a canned version (sweet potato or pumpkin both work! ), or simply bake a sweet potato until very tender. Once you have the sweet potato ready, measure out a half cup of the cooked flesh (I just use the middle; not the skin). Blend it with your favorite milk, like homemade almond milk, fresh ginger, turmeric, cinnamon, and a couple of pitted dates for sweetness. The dates make it taste like a holiday pie, but I’ve also made this smoothie with a frozen banana instead, if you’d prefer to go that route. 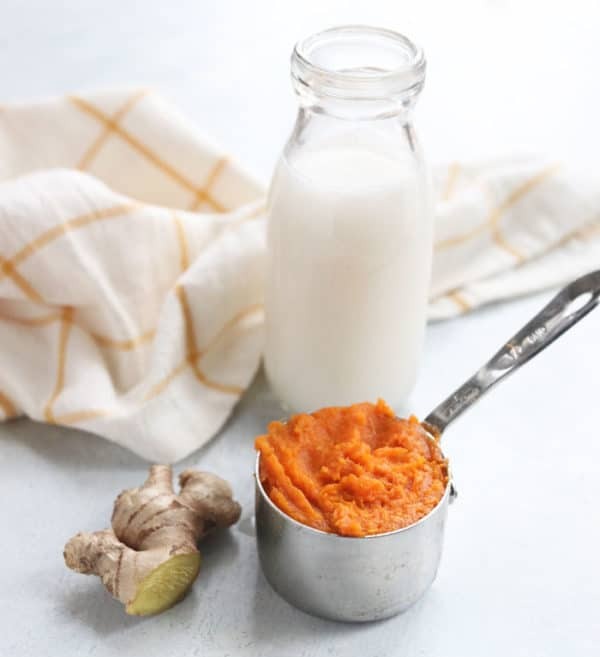 This SWEET POTATO SMOOTHIE is a healthy way to use up leftover baked sweet potatoes. It tastes like a holiday pie! Naturally-sweetened and dairy-free. 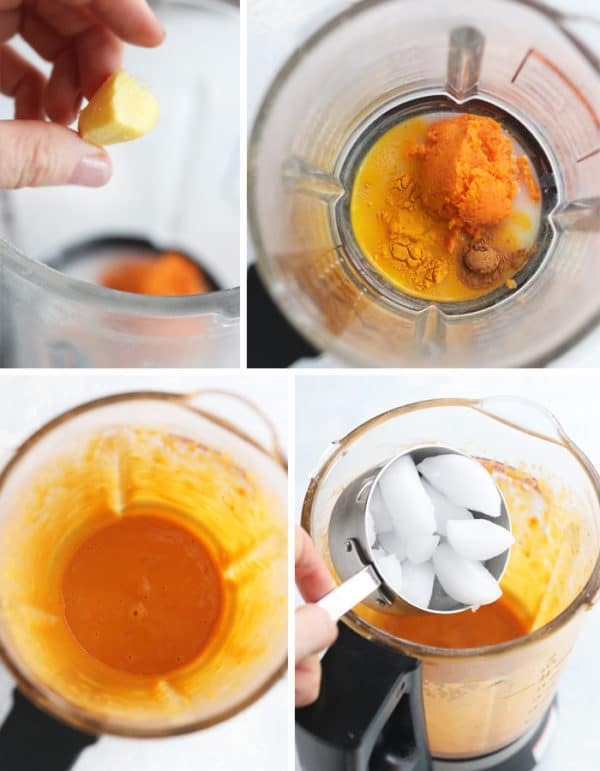 In a blender, combine the sweet potato, milk, 2 dates, ginger, turmeric, cinnamon, and hemp hearts, if using. Blend until very smooth. Taste the mixture, then blend in another date if more sweetness is desired. Once smooth, add in a heaping cup of ice cubes and blend until they are totally broken down. You can add more ice if you'd like a thicker shake, but keep in mind that more ice will dilute the overall flavor. As always, if you make any modifications to this recipe, please leave a comment below letting us know what you tried! We can all benefit from your experience. Reader Feedback: Have you tried adding sweet potato to your smoothies before? Let me know how else you use them in the comments below! 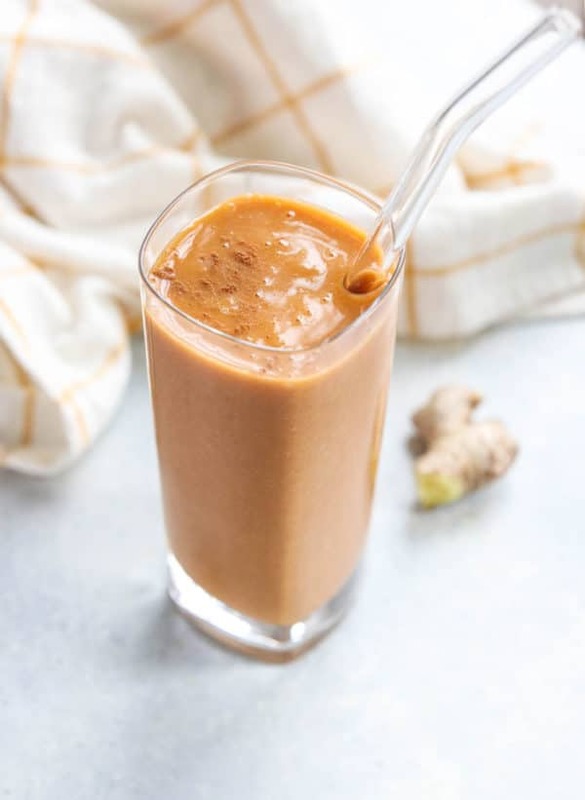 I made this to drink after a workout today and it was simultaneously refreshing and comforting! I cooked two sweet potatoes last night in the IP so I’ll definitely make again for breakfasts this week. Question on the nutrition info — does that include the added hemp hearts? This smoothie is delicious! It does take like pie and so full of anti-inflammatory ingredients! Another winner! I just made a double batch of this to share with my husband, and he told me I can make this again anytime! It’s delicious. This really does taste like pie!! So good and refreshing.